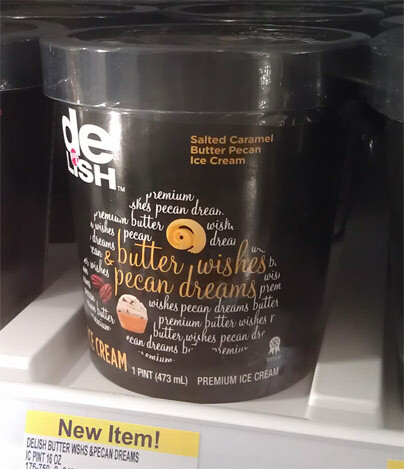 On Second Scoop: Ice Cream Reviews: Walgreen's REBRANDED ice cream lineup. Walgreen's REBRANDED ice cream lineup. 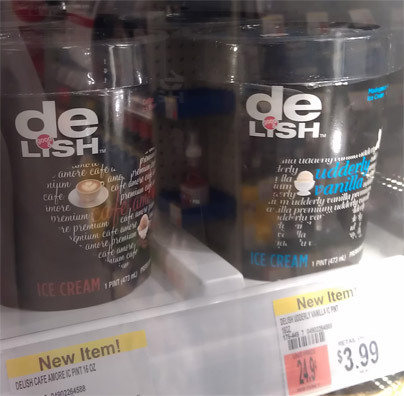 It's been a long time since we've had any of Walgreen's ice cream on the blog... yes, let's start with the fact that Walgreen's does actually make their own ice cream. Ok, now that that is settled, the reason they aren't on the blog much is not the fact that there stuff is bad, it's the fact that they rarely come out with new flavors. Well, low and behold, we've got changes! 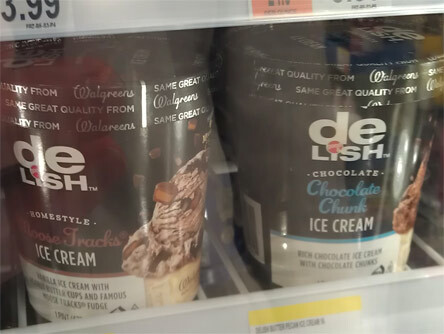 During the second half of 2012, Walgreen's started re-branding their ice cream. Nick and I have been talking about it a bit as the product line slowly came out, but when I went back today I have to say that the re-branding is looking pretty complete. 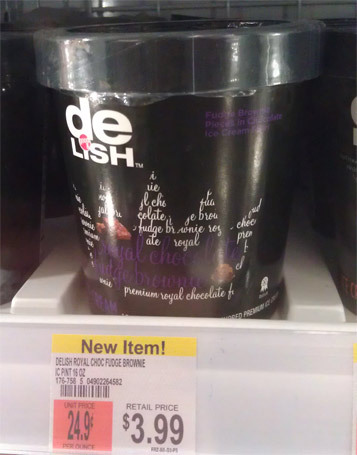 So good & de LISH is the new inhouse brand name and here it is on their premium ice cream pints. It's a tragically black background with a variety of white writing and then some color coded larger letters for the flavor name. Notice the star design to go with the strawberry cheesecake starlet name. 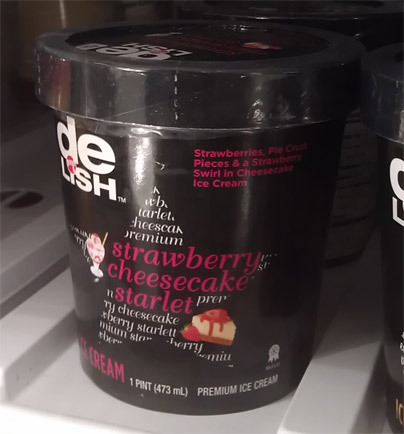 Let me just come out and say that I don't love the new packaging, but you have to tip your hat to the mighty description of "strawberries, pie crust pieces & a strawberry swirl in a cheesecake ice cream". Next up is royal chocolate fudge brownie complete with crown shaped naming artistic-ness hubbub picture bedazzled thingamijig. We're talking dark purple writing on a black background, how exactly is this suppose to catch my eye? Two more flavors: cafe amore (in the shape of a heart) and udderly vanilla (in the shape of a cow). Now I get that amore goes with cafe because they both sound kinda fancy and then amore is love is a heart, but I'm pretty sure udders don't taste like vanilla. Oh, alright, I never said I was funny, but you get my meaning, this branding is stretching the usual bounds of naming conventions. Well, now here is something new. On top of the foo foo premium pints, we've got these new homestyle pints. I assume these are meant to replace Walgreen's blue pints of non-premium ice cream. 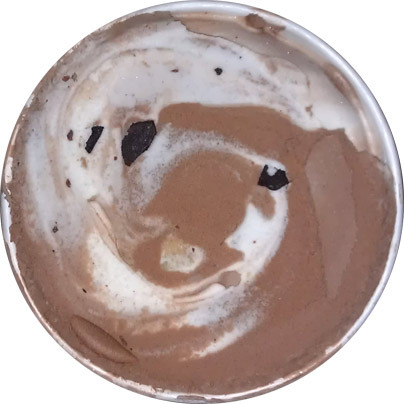 Falling peanut butter cups onto a giant scoop of moose tracks ice cream? Now that makes me hungry. 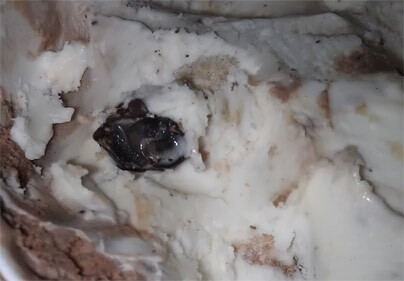 Falling chunks onto chocolate chunk ice cream? Also a win-win. Two more regular/homestyle flavors: banana split and rich vanilla (in 1.5 quart serving sizes). Notice both of these make you hungry as well. I'm dying to know what those little strawberry candies taste like. This is how you brand! One more foo foo pint with such a terrible design that I don't even know how to read it. Now I was going to torment Nick by picking up this butter wishes & pecan dreams with it's awesome "salted caramel butter pecan ice cream" description, but then I decided to leave this one for Nick and go for a combo I can never resist: chocolate and peanut butter! 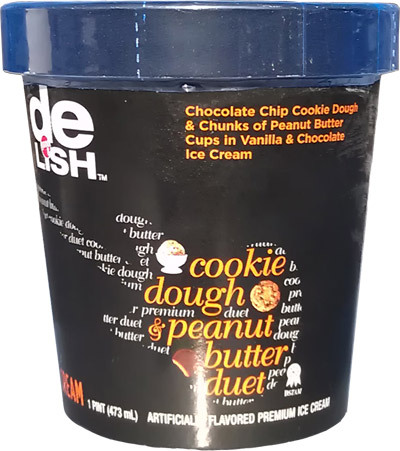 Ok, so here is a closer look at the very foo foo-ish branding of cookie dough & peanut butter duet. To be honest, there's very little here that makes me want to buy this pint other than the description. I appreciate the creativity, but let's really think about this. First off, it doesn't catch my (hungry) eye, especially in the poorly lit freezer. Second, it's hard to read. Oh, I get they are trying to be funny and playful, I mean duet = music = guitar = originality... but that doesn't mean I have to actually like the design. Third, there's just so much wasted space. The whole think is just chaotic and wasteful at the same time. You know, my wife likes to tease me because I tend to not capitalize when I email her. She says it looks funny and I say who really cares because the message is still the same. Well, this pint makes me realize my lazy self needs to capitalize because this just looks foolish. It just all seems so discombobulated. I never liked that faux font that looks like cursive but the letters don't connect, it just seems lazy (which is ironic since someone obviously spent a lot of time on this). I guess my big point is that the pint doesn't scream ice cream. 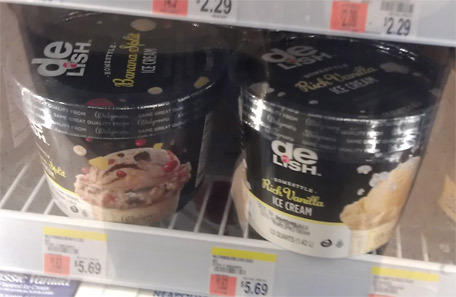 Yes, it was sitting next to other ice creams, and yes, everyone recognizes a pint container, but this is just bad branding on the premium side. I gotta call it like I see it. I really worry that this won't inspire anyone to pick up this pint. Alright, enough back story, time to crack open the ice cream. Well, it certainly makes a funky (aka appealing) first impression. I take my first few bites and I'm not instantly impressed with flavor profile but maybe it's because I'm too busy staring at the cookie dough (with built in chocolate chips)... so much cookie dough, but I'm not seeing the pb cups (other than the few slivers you see above). It's always hard to judge a swirled flavor, so let's take the two flavors one by one. The chocolate is nice, no complaints. It took a while to recognize, but it's definitely got a cocoa flavoring to it. It's even a little dry actually. Alright, cookie dough filled photo taken, time to eat all the bits! mmmm, pretty tasty. The dough is just a little dry and crunchy (in a sugary way). It's got a pretty strong cookie dough flavor with a little bit of chip crunch to it. There's definitely a nice cookie dough flavor buildinng up.... ok, moving on to cookie dough ball #6.... #7..... any chance this craziness will continue? Ok, I finally found a pb cup --- no, wait, it's just a sliver (not sure if you can tell that from the photo).... cookie dough ball #8.... #9... Now this stuff is pretty high fat so I'd like to contain myself to one serving.... but i really want to find those fabled pb cups. Now the vanilla base is decent.... nay, it's nice when it's all by itself. no complaints. very creamy and a nice flavor that pairs well with a cookie dough bite. They could easily sell this half of the ice cream by itself. So much cookie dough... crazy crazy crazy. If you were taking big bites, you could easily get 2 or 3 on your spoon... was that #20 for my serving? I don't even know any more. On Second Scoop: A few days have passed and it's time to attack this one with a little hope and a little patience. First thought? Eating a hard ice cream is not easy with a flimsy plastic spoon. The cookie dough bits continue to please with lots of flavor yet I still have zero peanut butter cups. It's funny how one mix in is excess while the other one is absent. 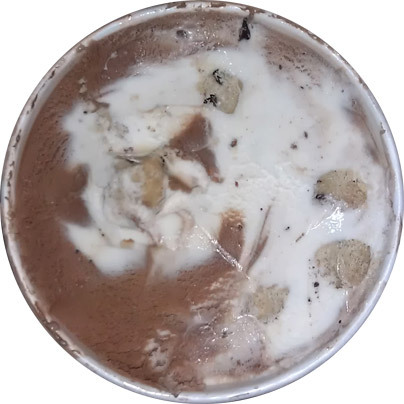 I know plain cookie dough probably isnt exciting enough to fit with their new foo-foo branding, but the flavors mixed together in my pint just seem like a waste. Final Note: I never did find that elusive peanut butter cup. Verdict? Quality product, but this should really be two separate flavors. We don't have many Walgreens near me but I def wanna check one out just to try a new flavor! Btw I like the fact Walgreens does their 1.5L in a round container vs the squared ones most brands use. I think it'd be easier to scoop! I think the so called "foo foo" packaging is designed much better than the boring home style packaging. I liked it too at first, but then the more I stared at it, the more it started to bug me. I must admit I like the packaging. I honestly never been a huge fan of B&J packaging. I always feel like I took a hit of acid and then tried to read a X-Men comic book while looking at their pints with all the colors and scripple all over it. I am sorry but it just sounds a little stupid to say that amore is a French word, it's actually Italian. I just tried this flavor tonight. Just wanted to add that I got a plentiful amount of Putter Butter Cups that were very tasty along with all the cookie dough. Seemed like every spoonful I either had a peanut butter chunk or cookie dough. The ice cream is definitely premium too. I really liked this flavor! Too bad that Walgreens uses High Fructose Corn Syrup in their ice creams. I won't be buying any as a result. It is unfortunate that they are not interested in using more natural ingredients. Sad :>( No Sherbet on the shelves. I especially like the Orange Citrus Sherbet. is the sherbet gone? I know not every store carries it. Nick and I will keep an eye out for it!